I have been compensated by Nature’s Bounty, but all opinions are my own. The post is brought to you by Activate by Bloglovin and its advertiser. All opinions are mine alone. Essential oils, aka aromatherapy is extremely beneficial in so many ways. I am a big fan of aromatherapy and use essential oils to help me feel better, relax and rejuvenate. Many of us have been using essential oils on daily basis for cosmetic purposes as well as aromatherapy around the house. Essential oils can promote the health of body, mind and spirit, help reduce stress. They have an effect that dually promotes calming and energizing. Whether in the bathroom, living room or any other room it can be use it around the house as a cleaning agent, and to give you the feeling and benefits of a relaxation spa right in the confines of your own home. Aromatherapy is the art of incorporating beautifully fragrant essential oils into our everyday lifestyle. My favorite ways to use essential oils around the home is to incorporate them into other functional products and needs. For example bringing them into my all-purpose cleaner, natural insects repellent, air freshener, laundry refresher, linen sprays and even my DIY candle. I often use a few drops of lemon oil and some boiling water to help remove burnt food from pots and pans. 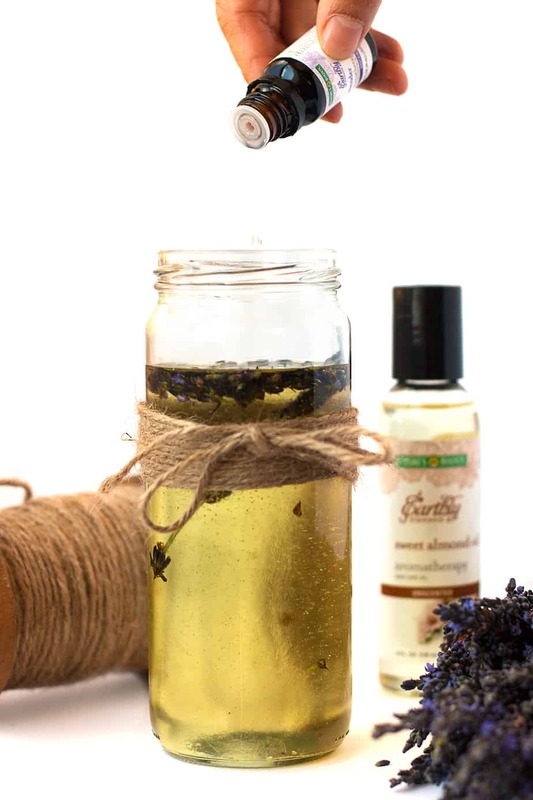 Today I am going to show you how to create this DIY lavender oil diffuser using Nature’s Bounty® Earthy Elements™. This easy and natural lavender oil diffuser has a fresh floral character with soothing undertones that is used for tranquility and serenity. It’s perfect for relaxation, or to create a calming environment and as mentioned keeps unwanted bugs at bay all year round. Lavender oil is traditionally used for massage. 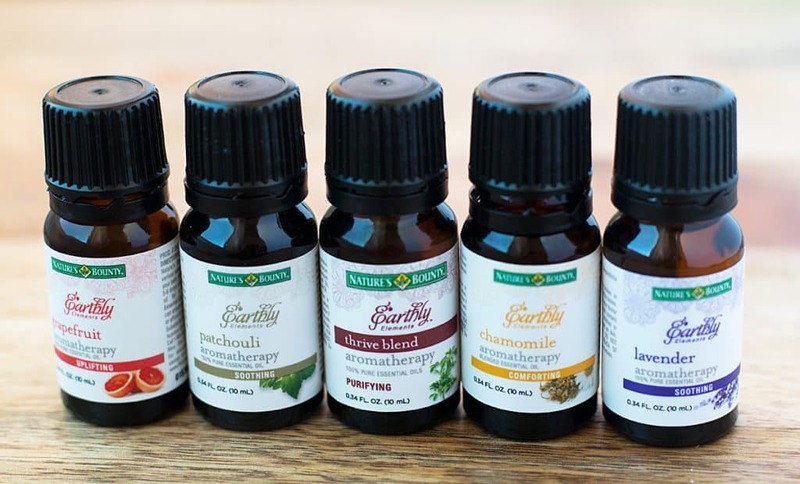 I have tried each kind of the Nature’s Bounty® Earthy Elements™ line, from those that are more refreshing to those more aligned with soothing. I personally like to mix it up a bit and have at least 2 different oils going in different parts of my home. If you try that you might then be able to better determine which is your favorite, or as in my case figure out that you like them all and like different rooms associated with different scents. – They use steam distillation to manage both temperature sensitive materials and separate plant compounds. – And third there is an expeller process which brings a high degree of pressure to crush the nuts and seeds, in a method that is mechanical and non-chemical. This helps the oils run freely and naturally. Nature’s Bounty® is a trusted brand and I always keep an eye out for their best and latest products. For healthy living they are one of the premier brands that sets the bar for quality products that I know will not only do the job but will also be safe for my family. With a product like this where there are hundreds of applications in our daily lives it’s great to have the peace of mind to go with a brand you trust 100%. Mix all the ingredients (except reed diffusers) in a mixing bowl. My most favorite thing in the world is the smell of lavender. I have been wanting to make one of these for my bathroom and you have the most perfect recipe. Can’t wait to make one. Thanks for sharing. 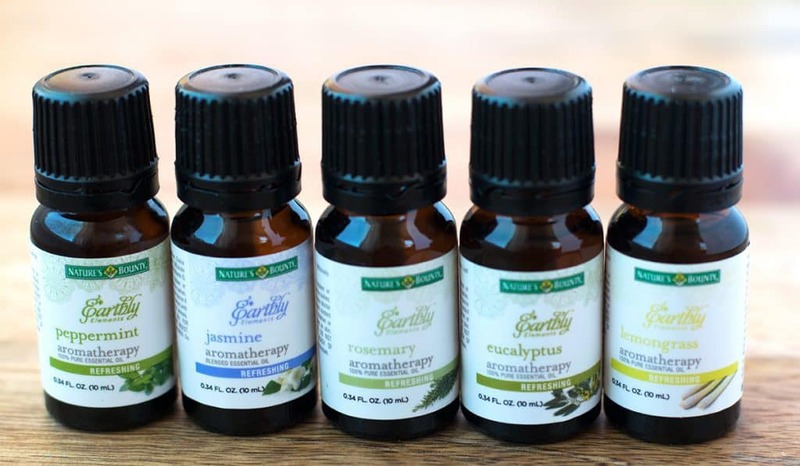 I use essential oils a lot and they really do add something to our home and health everyday. Peppermint is my favorite, but I have never made my own oil diffuser though. I love how beautiful yours came out. The lavender is truly a nice touch! I love finding uses around the house for essential oils and I enjoying trying new DIY recipes with my collection of oils. It really is amazing how many uses there are for essential oils! Thanks for the diffuser craft idea, it came out beautiful! This would look great on the bathroom counter! Lavender is such an AMAZING scent! LOVE LOVE LOVE it! I’m curious to know how the grapefruit essential oil smells like. This will be great use as you mentioned to keep unwanted bugs at bay all year round. I love this diffuser. I bet it smells so amazing. Lavender is my favorite scent too! This looks so simple and beautiful! I still haven’t tried essential oils even though I keep telling myself that I am going to. I really need to stop putzing around and try it already. I also love using essential oils! We use them for so many things. I just can’t get over how amazing they smell! This is such a great idea for a diffuser and to help make your space smell more inviting. I Love Lavender This Is Awesome I Must Make For My New House We Just Moved In & Put Them All Around Thank You! I started using a diffuser and I love it. I will have to go and find these oils now! I love essentials oils. I didn’t know that Nature’s Bounty makes them. I have to go shopping now to get them as they leave a wonderful scent throughout my home. Love the presentation! We love our essential oils, and need to use them more often. I love lavender oil. It’s such a calming, relaxing scent. I’d love to make one of these. What a great thing for a bathroom or bedroom. I’ve been wanting to try essential oils for a while now. 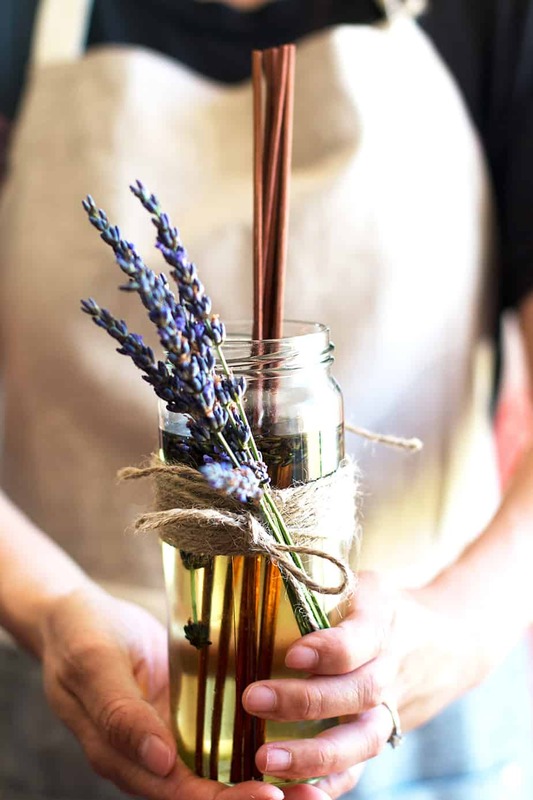 I love the smell of lavender so I’m definitely going to have to make one of these. I’m sure the scent is amazing and what I like is that you can also use different oil depending on what scent you want! Lavender is perfect for the summer. I’d love to give this a try! What an awesome defuser!!! Lavender oil is my favorite oil. I have a defuser in my room that I use lavender in all the time! How simple and lovely!!! I love essential oils – especially the smell of lavender. Definitely re-creating this for my bedroom. SO PRETTY!!! I Absolutely LOVE the lavender tied to the front. Its the perfect touch! 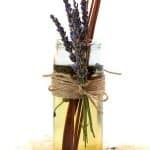 I love lavender essential oil for the myriad of health benefits it has, but I think my favorite uses are diffusing it as a sleep aid and applying topically for bug bites! Its definitely a favorite around this house! This is a great idea and you dont have to worry about an accidental fire. I have a few of these essential oils. I bought warm sugar cookie and clean linen. The sugar cookie is my favorite. 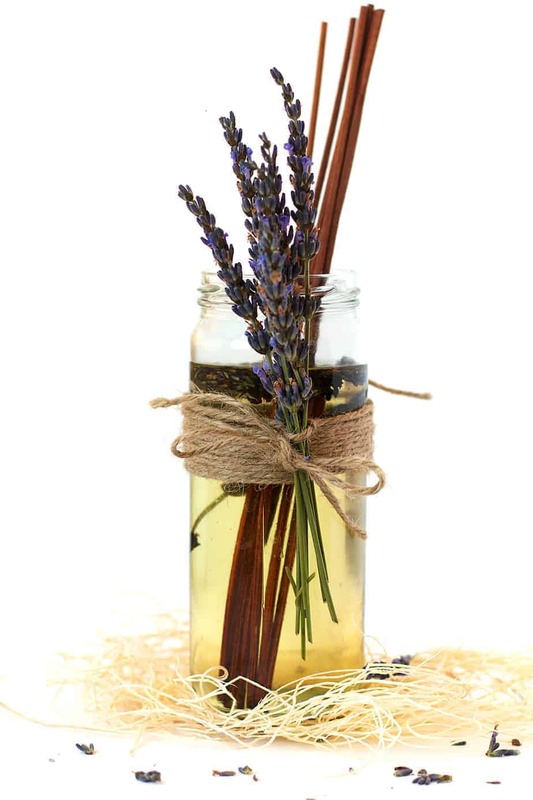 I love lavendar and making my own diffuser sounds perfect I will most certainly try to make this in our new place once we move to make sure it smells relaxing 🙂 May be a good idea to use in my son’s bedroom so the youngest sleeps, I know lavender helped my middle son sleep better! I bet this smells so heavenly. I love the smell of lavender in my home. Essential oils are the best! I get so stressed out sometimes. I could really use these oil diffusers to help me relax sometimes. This sounds really great to me. Love this idea. I never thought to make my own disfuser. Lavender is by far my favorite scent too. so relaxing. I use aromatherapy a lot in my house. It relaxes me when I’m feeling stressed out. I always buy a diffuser but this diy version looks so simple to make. I’ll have to try it. I didn’t know how to create a lavender oil diffuser. I have forgot I had the stove on and burnt the pan. I will try the lemon oil to remove burnt food from my pan. Thanks for the tip. Absolutely gorgeous photography and I love the idea of making a diffuser! GREAT POST.